Guidestone’s wonderful volunteers increase the capacity of the organization, and are an integral component of meeting our mission. 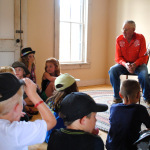 Working to strengthen the local food economy and growing the next generation of farmers, ranchers and leaders is not the work of one organization but must include the concerted efforts of a community. 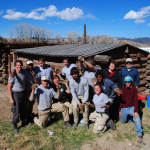 Through knowledge sharing with staff and other volunteers, and working on place-based projects, volunteers have the opportunity to develop a deeper connection to place and foster learning communities. 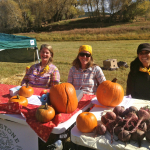 Whether running the cider press at the Pumpkin Patch Festival, leading tours of the Historical Hutchinson Homestead and Learning Center, or harvesting at the Salida School Garden, volunteers provide Guidestone’s programs with the community support we need to succeed! To learn more about any of these opportunities or talk about other ways you can support us, please contact info@guidestonecolorado.org or call 719-239-0955. Thank you for your support! 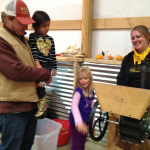 Volunteer teaching Farmhands about leatherworking. 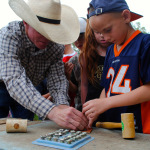 Volunteer at Ranch Camp shares stories with Farmhands. 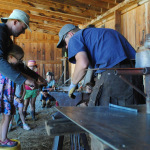 Volunteers at Traditional Arts Camp do a hands-on blacksmithing demo. Guidestone volunteers at Pumpkin Patch!